Sunflowers – No vegetable garden is complete without a few cheerful sunflowers, whether the massive stalks of ‘Russian Giant’, bee-friendly blooms of ‘Lemon Queen’, or the knee-high flowers of ‘Musicbox’. If you’re into the more unusual shades, try ‘Prado Red’, a deep hued sunflower with chocolate and mahogany flowers or the pollen-less, but spectacular ‘Strawberry Blonde’, a hybrid with soft yellow tips and burgundy centers. 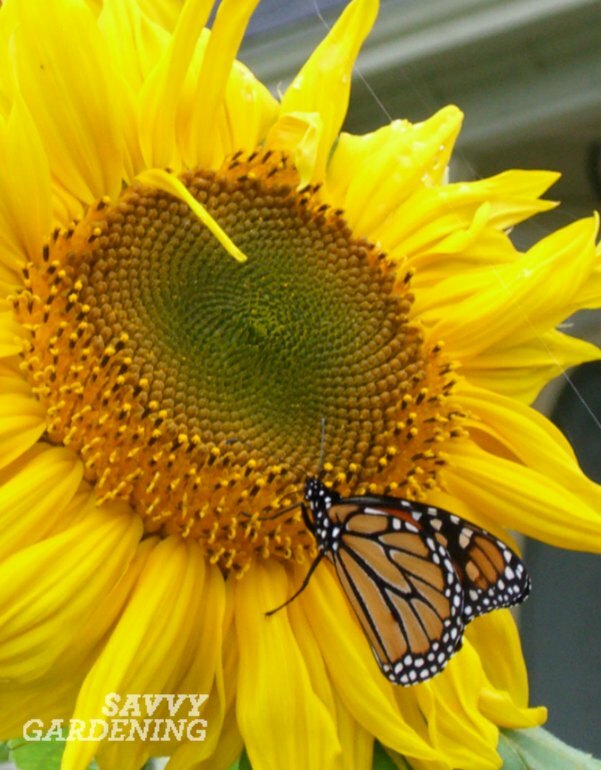 Cheerful sunflowers entice bees, butterflies and good buggies! Cosmos – Cosmos are easy to grow and incredibly floriferous, with each plant yielding hundreds of cheerful daisy-like flowers from mid summer until frost. The well-branched plants grow two to five feet tall, depending on the variety, and are popular with bees, butterflies, and hummingbirds. ‘Sensation Mix’ is a classic combination of white, light pink, and magenta, with large four-inch wide flowers. Stick to the single flowering cosmos if you wish to lure good bugs and pollinators, as the frilly varieties, like ‘Double Click’ are not as appealing to these creatures. Zinnias – Pick a colour, any colour and you’re sure to find a zinnia flower to match (ok, maybe not black or true blue, but virtually any other colour including lime green!). In my opinion, zinnias are among the top annual flowers for the vegetable garden. Some cultivars bear small, button-like blooms, while others produce show-worthy four to five-inch wide flowers. Butterflies will flock to the blossoms, which also make long-lasting cut flowers. ‘Apricot Blush’ is a large flowering cultivar with densely petalled double blooms that fall in the range of apricot-pink to salmon-blush. Or, attract attention with the quirky quilled petals of cactus zinnias. The four to six inch flowers come in bright orange, red, pink, yellow, and white and are borne on sturdy, four-foot tall plants. Who doesn’t love the beautiful blooms of zinnias! They’re a favourite of butterflies and bees. Nasturtiums – Nasturtiums are ridiculously easy to grow, extremely vigorous, and bloom their heads off for months. Their palette includes all the warm shades – yellows, oranges, reds, and crimson-pink – as well as tones of white with newer introductions like ‘Buttercream. Top picks include ‘Vanilla Berry’, a unique nasturtium with ivory flowers highlighted by bright strawberry splotches, ‘Cherries Jubilee’, a trendy choice with doubled rosy pink flowers, and ‘Alaska’ which offers a one-two punch to a rainbow vegetable garden as the variegated cream and green leaves are as eye-catching as the bright red, yellow, and orange blooms. What are your go-to flowers for the vegetable garden? as a kid my |Dad as well had rows of vegetables, and separately but right near by, annual flowers including those above but as well Asters. there was as well a row of peonies and they seemed to bloom just before the end of the school year. I thought I was pretty special bringing in a huge, so it seemed to me, bouquet of these for the teacher. Don’t forget Calendulas! Not only are they great in bouquets, but the petals are wonderful in salads or as a substitute for saffron to color rice. For a more compact version, I like the variety ‘Bon Bon’. Don’t forget the Marigolds! They kill nematodes under the ground and Bumble Bees and Butterflies love them. They also add so much color and are very low maintenance.